It’s wet, windy, cold and ‘orrible outside and so the urge for a good old fashioned slow cooked beef and ale casserole struck me. 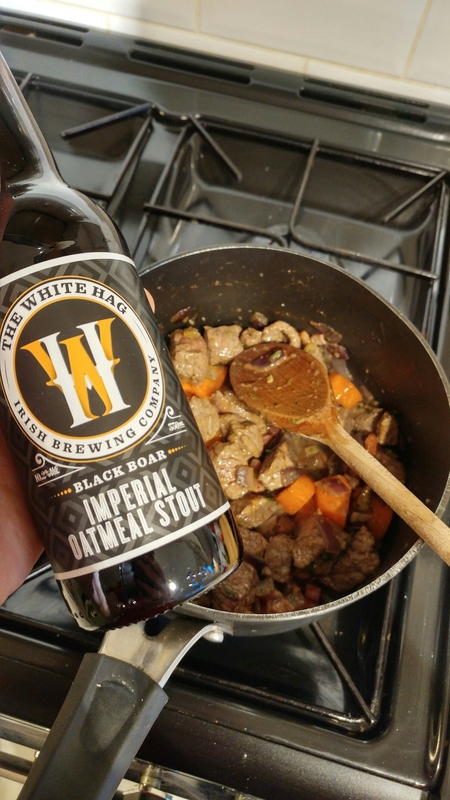 With a case of White Hag Imperial Oatmeal Stout in the cupboard I got to thinking, and got to work! I’m was so happy with the results I thought I’d share the recipe. Enjoy! Gently sauté the pancetta, finely chopped onions and celery in a teaspoon of oil until the onions soften, add the garlic and finely chopped rosemary then fry for another 2 minutes. Meanwhile season the plain flour with salt and pepper and coat the beef. Remove the onions and pancetta mix from the pan and set aside. Brown the floured beef in the same hot pan. Dice and peel the carrots and add to the pan then return the onion and pancetta mix. Add the stock cube to a small amount of boiling water (100ml) to make a rich, thick stock (this will be watered down by the beer). 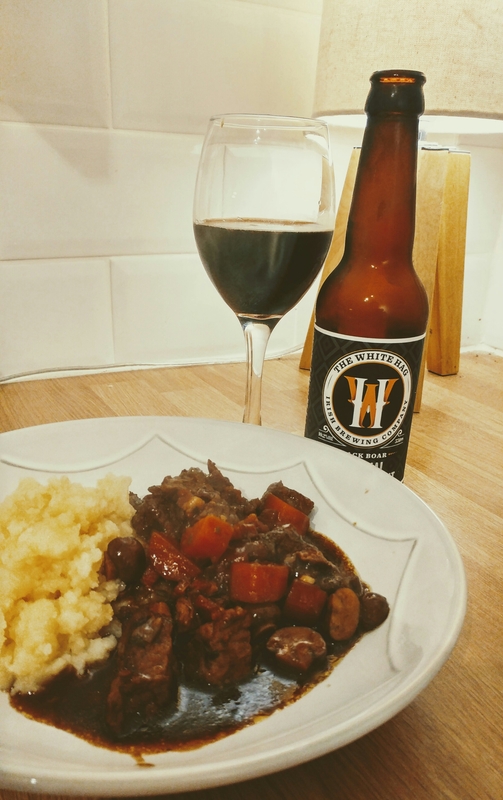 Add half a bottle of the stout (165ml) and the rich stock to the pan. Halve the mushrooms and add to the casserole. Cover and leave on a very low heat for 2-3 hours, until the beef is tender. Stir regularly and if there is too much sauce (or it is too thin) leave the lid off for a while to reduce and thicken. Serve with buttery mash and a glass of Oatmeal Stout.